Mardi Gras and New Orleans are synonymous. Known as probably the biggest free show in the country, Mardi Gras has withstood the test of time and is still a vital part of the fabric that makes New Orleans unique. Visitors and locals alike are exhilarated by these moving masterpieces known as floats, as masked riders shower them with plastic treasures, lighted marvels and shiny doubloons. People come from all over the world to take in the sights and sounds of a tradition like no other. There are few delights that people can compare to their first Mardi Gras experience. But, one experience that might surpass it is almost a rite of passage for locals. The experience of being one of those masked riders is almost second to none. It is a high that is not easily accomplished. My first experience as a rider happened when I was about 10 years old. I will never forget the thrill of seeing a sea of people standing there, waiting for the parade to pass them as the float turned on the street. I looked down and saw hands and excited faces and heard the screams of “Throw me something!” in unison. If I had to pick one word to describe it, magical would be that word. Riding as an adult is no less exciting. It is still a thrilling feeling to see all those faces staring back at you and waiting for the gifts that you bear. I cannot describe the utter excitement I feel when I am loading a float the night before, anticipating an evening that is sure to be one of my most favorite of the year. 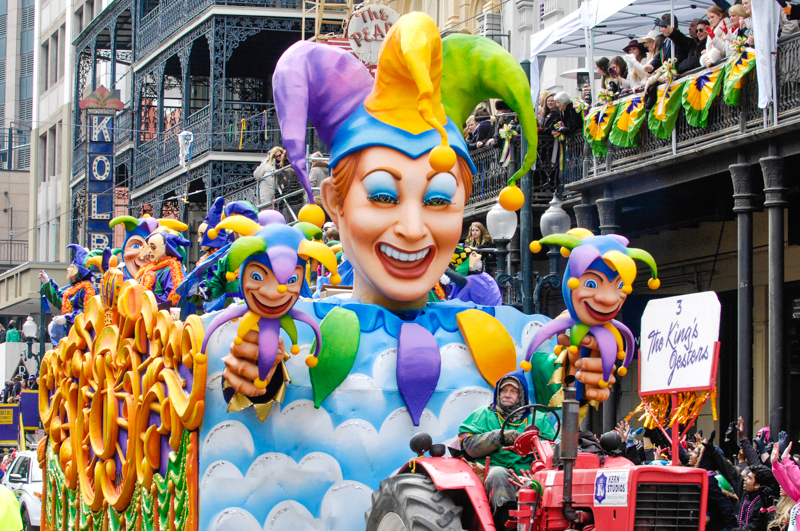 While riding on a float is as much fun as—or maybe more than—standing on the neutral ground, a lot of preparation and funds go in to preparing for your two- to three-hour ride along the parade route. As a rider, you probably already know even as you are departing your float that you plan to return the following year, and so you begin laying the groundwork for how you will be better, your beads will be more organized, and you will become more of an all-around Mardi Gras star. After all, you must not let down those people standing on the street. While the rest of the world is planning Christmas, riders are busy planning the most wonderful time of the year. They know as New Year’s rolls around that Carnival time is right around the corner. Dues will be due, throws need to be purchased, krewe balls planned, and the parade night needs to be in order. Float spots, costumes, snacks and beverages need to be assigned. For people who ride in truck parades, building their actual float is underway. And all things Mardi Gras are in the air. The parade itself is a work in progress from the minute the parade ends the previous year. There will be meetings and gatherings and more meetings and planning to make sure that the fabulous spectacle that is Mardi Gras can be brought to you every year. Floats are judged as they pass by judging stands to make sure that the float captain is doing his or her job and that the float as a whole is contributing to the parade. There are strict guidelines to be followed and you can be fined or escorted off the float for abusing said guidelines. Uniform codes are just as strict and masks must be worn at all times while the parade is rolling. Every single person you see riding in those parades has spent countless hours planning, purchasing and preparing to make sure you, as a parade-goer, go home having had the time of your life. It takes a village, as they say, and that sentiment applies. It takes a small village or a large city to bring this enjoyment to you. I am exhilarated when I am a part of that community. My arms may be sore from hours of throwing trinkets and my legs tired from standing and trying to hold my balance while I dig for treasure to throw off the float. But I always end the night with a smile, having had the best time with some of the best people while riding through the street, feeling like a rock star.